Flowers in the church porch. We used blue voile shot through with black, folded over again and again, to illustrate the deepening levels of darkness – (i) very early in the morning while it was still dark, (ii) the women returned to the place of public execution, (iii) where they entered an open tomb, and (iv) discovered the body of their loved-one missing – and gold voile shot through with blue to illustrate how resurrection enfolds suffering and transforms it into glory. The Lenten fast is well and truly broken. A delightful feast with friends around the table, finished off with Jo’s latest dessert, a Mary Berry recipe. Not, God is pretending to be dead. Without death, there is no resurrection. Jesus is clear on this. His disciples didn’t understand, couldn’t accept it. They still squirm at this. 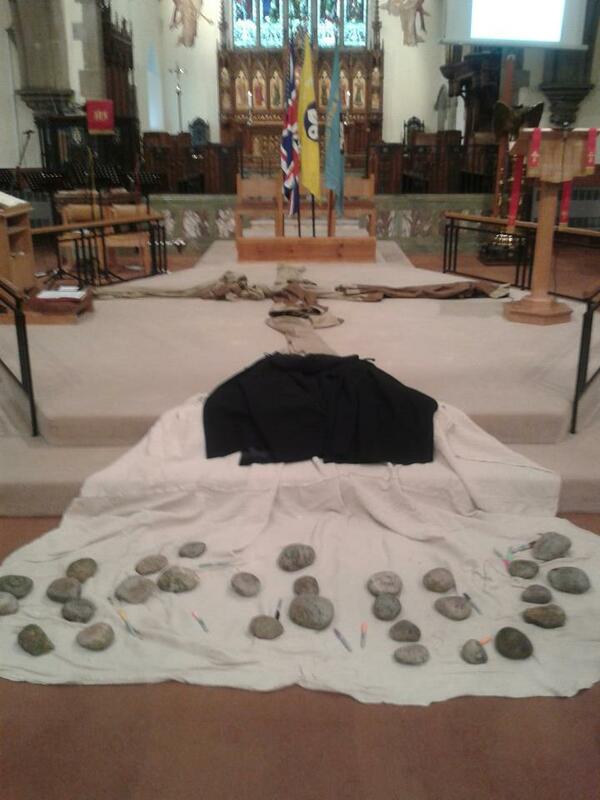 The temptation is to conflate Good Friday and Easter Sunday, sending Holy Saturday into exile. 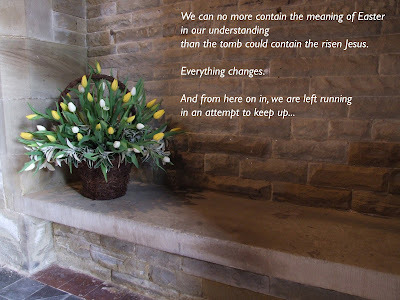 And there may be good reasons for conflating Good Friday and Easter Sunday, for the cross is at one and the same time suffering (Matthew, Mark), completion (Luke), and glory (John). But there are no good reasons for exiling Holy Saturday. To do so is to dismiss or deny our experience of loss and pain and grief, of death; and to dismiss or deny God’s self-giving act of entering into that experience; and so – ironically – to dismiss or deny the hope of resurrection. As a friend of mine put it, without Holy Saturday we have nothing to say in response to suffering. The other day a high-profile media-savvy Church of England cleric made a vitriolic attack on evangelicals as being a group who dismiss or deny suffering. It was a shoddy piece of journalism, and a thousand stories could be told demonstrating the falseness of its claims. But (to add injury to insult) a far more balanced piece could have been written demonstrating that evangelicals do, indeed, resist entering-into the deep mourning of loss and lament at God’s absence that our scriptures do not shy away from. This I have seen, over and over again...though we are called to mourn with those who mourn; though, indeed, mourning is the prerequisite condition for experiencing God’s comfort. Jesus’ first disciples couldn’t cope with sitting in that place of God’s silence, God’s absence, God’s choice not to intervene in a particular way, for just one hour in the Garden of Gethsemane. Darkness is drawn over what they went through while God was dead. We are no different. That is not something anyone (let alone a shepherd of God’s people, for God’s sake!) should attack anyone for. And yet the challenging invitation remains extended, to enter into this part of the Story too. 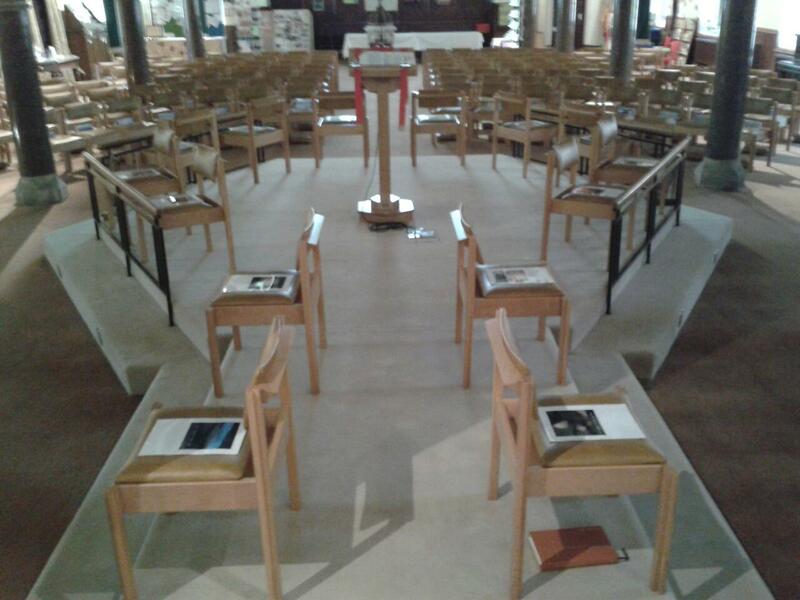 From this afternoon at St Peter’s - for close-ups of the images used, see here. 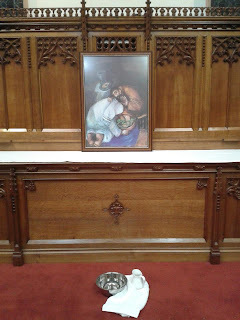 In the side chapel, you will find a painting of Jesus washing Peter’s feet, a bowl of water and a towel. Sit a while. Allow Jesus to speak to you, through what you see. Where has he led you since this time last year? In what ways has he surprised you, or taken you somewhere you were not sure you wanted to follow? Have there been times of walking together, and times of resting together? The disciple’s feet were dusty because they had been following Jesus – his feet stirred up the dust that settled on theirs. 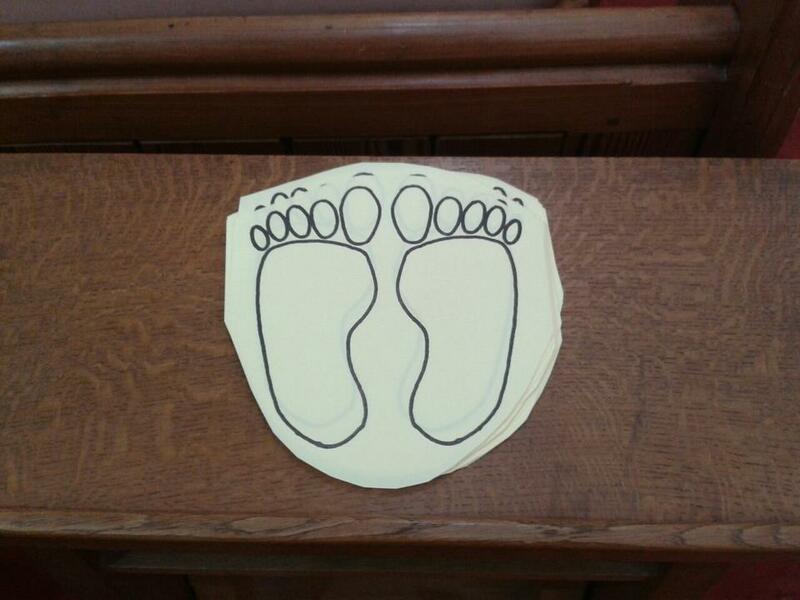 Take a pair of cut-out feet. Hold them in your hands. 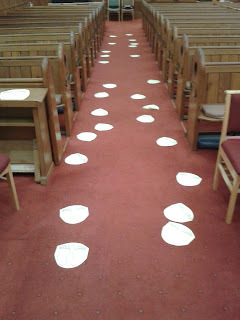 Bring to mind those who are following in your footsteps – your children, godchildren, grandchildren; the home group or cell you lead; anyone who looks to you as you help them to follow after Jesus. Place the footprints on the aisle, to create a path. Who are you not yet able to love? for that individual you find hard to love. 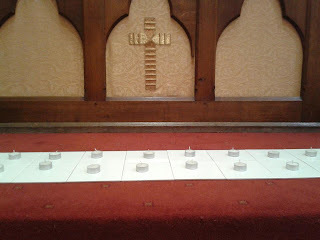 Light a candle, to symbolise your commitment to the light of God’s love, shining in the darkness of fear and division. At our Palm Sunday Parade service this morning, we took Luke’s account of Jesus' entry into Jerusalem as our starting-point, and played with the striking images of throwing cloaks on the ground before Jesus, and of the stones crying out in praise were we to fall silent. I employed my clerical cloak (very handy in this inclement weather we are experiencing) to introduce the idea of cloaks – cultural images including Harry Potter’s invisibility cloak – as those things we hide behind. 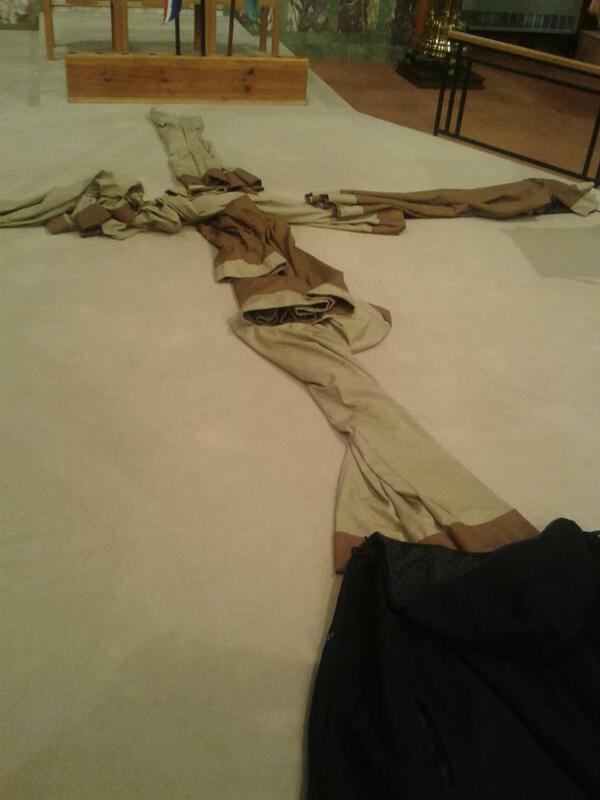 With each of a series of examples – I am shy; I am fierce; I am dependable; I am invisible; I am needed; I am funny; I am lonely; I am unwell – we laid a cloak (old choir robes, no longer used but still lurking in the vestry wardrobe) down, forming a cross. I had also taken thirty of the larger stones that mark out the Labyrinth in our Prayer Garden, and arranged them to form the name JESUS, or, ‘God Saves!’ and during the service the congregation were invited to join our praises with those of the stones, using permanent markers to write on them. Later today they will be returned to the Labyrinth. People wrote a mix of praise and thanksgivings. 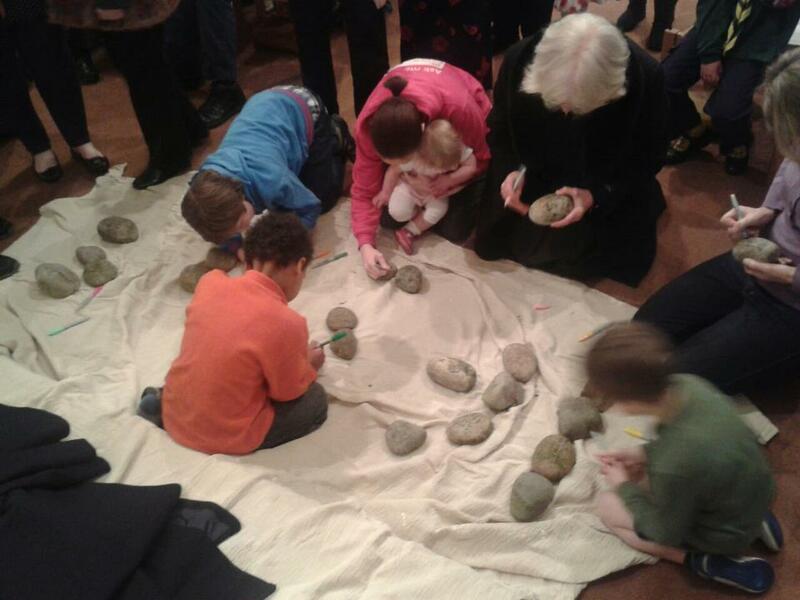 It was wonderful to see how quickly and how many people came forward; and also to see younger members – especially the cubs and scouts – lift up stones so that older members, who could not get down on the ground (or if they had, would not have got back up) could join in. ...is still a week away, but I have been reflecting on the account of Jesus washing his disciples’ feet, found in John13:1-17. Jesus asks, “Do you understand what I have done for you?” I’m not sure that we have. There are two common understandings of this passage, one concerned with ‘sin management’ and one concerned with service. the disciples’ feet are dirty because they have been following Jesus – because the dust thrown up by his feet has settled on theirs. So unless Jesus has been leading them into sin, the ‘sin management’ interpretation misses the mark. Jesus washes his disciples’ feet because Jesus got their feet dirty in the first place – and then tells them to do likewise. Jesus washes his disciples’ feet not to demonstrate sin management or to demonstrate service per se but to model discipleship. What would you do if God put all things under your power? You might serve yourself. You might make others serve you. You might even choose to serve others. Jesus chose to initiate a movement. 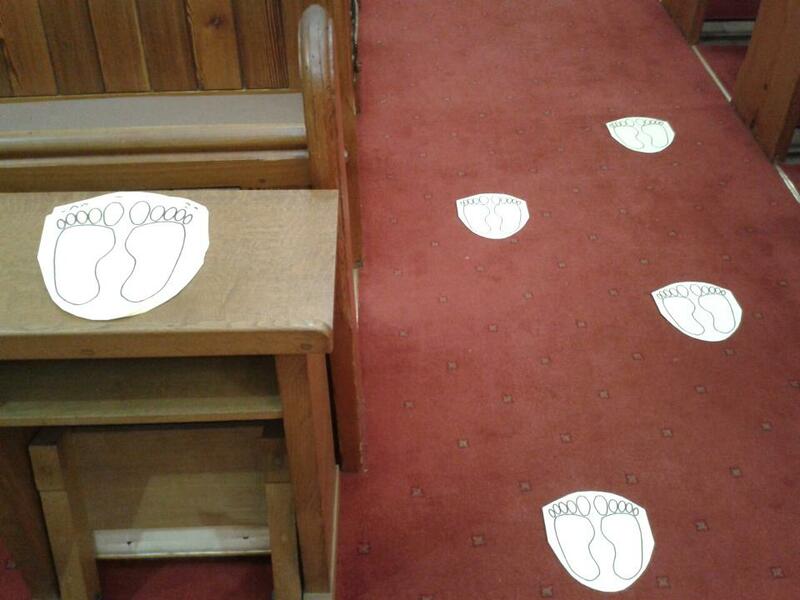 Jesus has called a particular group of people to follow him, to walk in his footsteps, to learn from him. He is fully committed to them: to ministering to them in the consequences of what he has called them into; and also to commissioning them to multiply exponentially what he has inaugurated. Go and make other people’s feet dusty, and having done so, wash their dusty feet: in doing so, you are not only ministering to them but also commissioning them to be disciples who make disciples. As my wife and I have sought to follow Jesus, he has called us to follow him from place to place – for an extended season, with nowhere to settle long – and where we have led we have called our children to follow, to come with us. This has been an adventure, and we don’t regret it, but it has been hard at times. Right now we know that we will be moving on again, but we don’t know where we are moving to, and that is uncomfortable. In following me, my children’s feet have become dusty. I can chastise them for sitting down at the table with dirty feet, or I can get down on the floor and wash their feet. That’s the first aspect, the need to attend to their weariness and irritations – and to not place undue burdens on them. And then there is the other aspect, commissioning them to call others to follow their lead – not to come with us when we move, but to carry on doing here the things they have done: befriending the friendless kid; picking up litter on the way home from school; taking responsibility for things that facilitate worship, where others are not forthcoming. What else does it look like? What might it look like, where you are? I’m reflecting on the need churches – like any family or community – have for material and financial resources. We are often tempted to believe that the way to address our resource needs is to attract a larger crowd. More people, more money. On one occasion, Jesus fed a crowd of more than 5,000 people, with five small loaves and two small fish (Matthew 14:13-21; Mark 6:30-44; Luke 9:10-17; John 6:1-15). Some people suggest that what actually happened was that others, resistant at first, got out their food and shared it too. After all, a change of heart is a greater miracle than full stomachs. But it doesn’t add up. If a significant number within the crowd had brought food with them, the crowd would not have needed feeding in the first place. The crowd benefit from the food, but they don’t contribute anything: they don’t even participate in the distribution or in the clearing up afterwards. In fact, the crowd simply add to the workload of the disciples. The ‘crowd’ represents those we serve (and we should serve gladly). But Scripture reveals – and our own shared lived experience confirms to us – that our resource needs are never met by attracting a crowd. If the crowd is not the answer, then we are often tempted to believe that the way to address our resource needs is for the faithful few to give more. But the disciples had very little. The faithful few always have limited resources. Not just finite resources (everyone’s resources are finite), but limited resources. God knows this, and indeed, would appear to prefer to use such people. There is never enough money to do the thing God has asked you to do. Never enough. Why? Because if we had enough, we would receive the glory. But if there is not enough – not by a long way – and yet God provides, the glory goes to him. Does that mean, then, that we don’t do anything? Not at all! To return to the feeding of the multitude, Jesus involves his disciples from start to finish. Let us consider the various forms of capital: spiritual, relational, physical, intellectual, and financial. How is each at play in this event? This story begins with spiritual capital, with the covenant relationship with God (“all that I am I give to you, and all that I have I share with you”) and shared kingdom responsibility that Jesus knew and was drawing his disciples into. Though the four Gospel writers draw out different emphases, the context for this story is one of conflict between the life-affirming kingdom of heaven and the enslaving prince of this world. As Jesus draws his disciples, spiritual capital overflows into (overflowing) relational capital. Andrew looks beyond the disciples to find out whether anyone has any resources they are willing to contribute. He asks around. The crowd is a poor return for his investment (1:5000+) but hidden in the crowd of people who have come to Jesus for what he can do for them is one person who is open to respond – and one disciple who is open to bring them together. Relational capital in turn releases physical capital. In this situation, the physical capital is edible. In itself, it is not enough; but, blessed, broken and shared, it not only goes far enough for everyone to eat their fill, it creates a surplus. The surplus amount speaks to us (a symbolic reminder of the tribal affiliations God liberated from Egypt and would shape into a people; a symbolic indication that in Jesus, God was liberating and people-making once more); but it is clear from Jesus’ instruction that he also intended the surplus to have a literal benefit – that, rather than being wasted, even more people might be fed, somewhere else, before the bread went stale. Stewardship of physical capital requires an investment of intellectual capital. God-given intellect does not meet the need, but it plays its part. Jesus has the disciples organise the crowd into groups of a certain size, and deploys them to distribute the bread and fish. 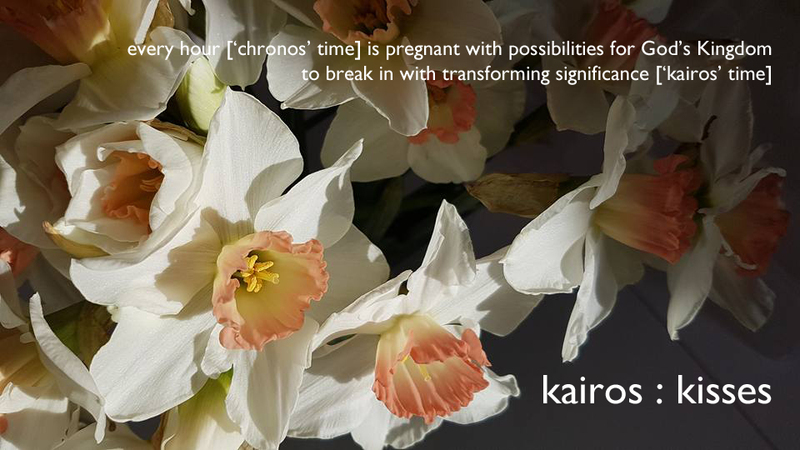 This is not a chaotic free-for-all, whereby some receive too much and others go without. Finally, we come to financial capital. At first we might think that there is no financial capital involved in this miracle of provision. Philip does suggest that two hundred denarii would be woefully inadequate (intellectual capital helps us to be realistic about the need facing us, which is essential, for denial of our need separates us from the resources of heaven) but as it turned out, no money was required. And that in itself is significant, for whatever financial resources the disciples had – and needed – were not depleted. Financial needs are real. God is capable of meeting them. Part of his meeting our financial needs may include enabling us to do certain things without cost. 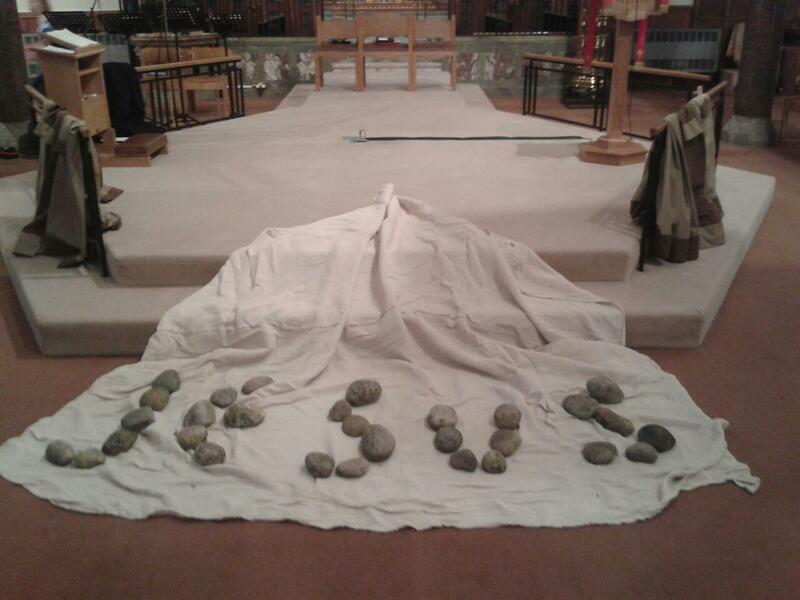 How, then, do we partner with God in relation to our resource needs? By investing what he has given us – creatively; prayerfully; generously – and asking for what we need. One last observation to make about having welcomed so many people into ‘Sacred Space’ this week: what do I hope will happen as a result? and that the people who encounter God there would go out and tell others what the Lord has done for them. Both these things have happened, again and again, this week. So what do I hope will happen as a result? I hope that God’s renown is told in this community. 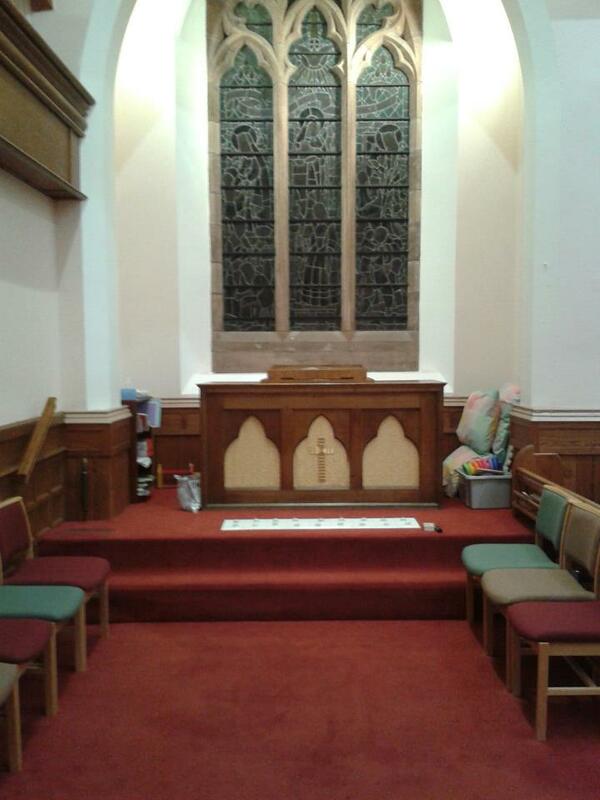 I hope that the local church in this place will gain confidence in, and a reputation for, creating the kind of space in which people can find that they have been found by God. And I hope that some of the people who have encountered God this week will not give up; and that some of the people they share their story with will not give up. This way, I hope that we will avoid filling the church for the sake of filling the church; but that, in time, starting small – no, smaller than that – those who are seeking to be found, and to see others found, will grow, and grow. Then the alongside-effect will be what we cannot bring about: that Jesus will have grown his church. 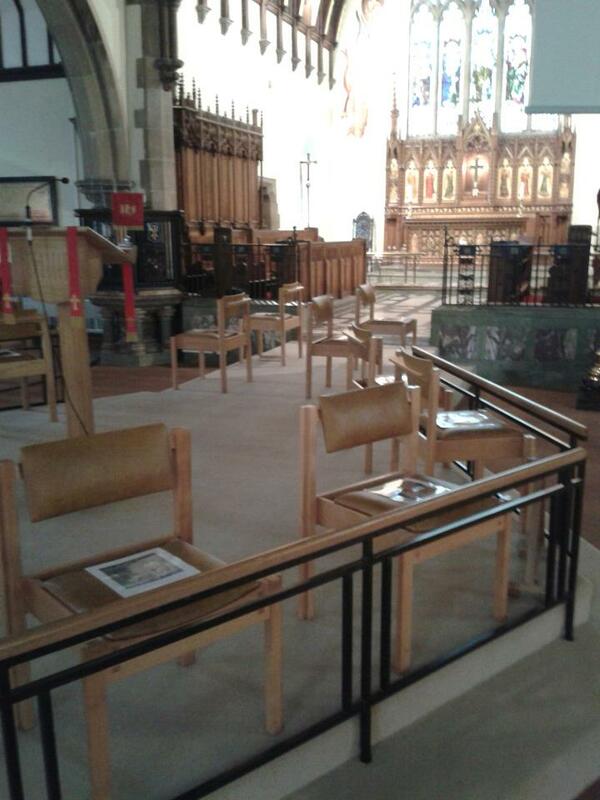 Over the past five days, St Peter’s Church and Prayer Garden have been open 9:30am-3:30pm, as a Sacred Space. 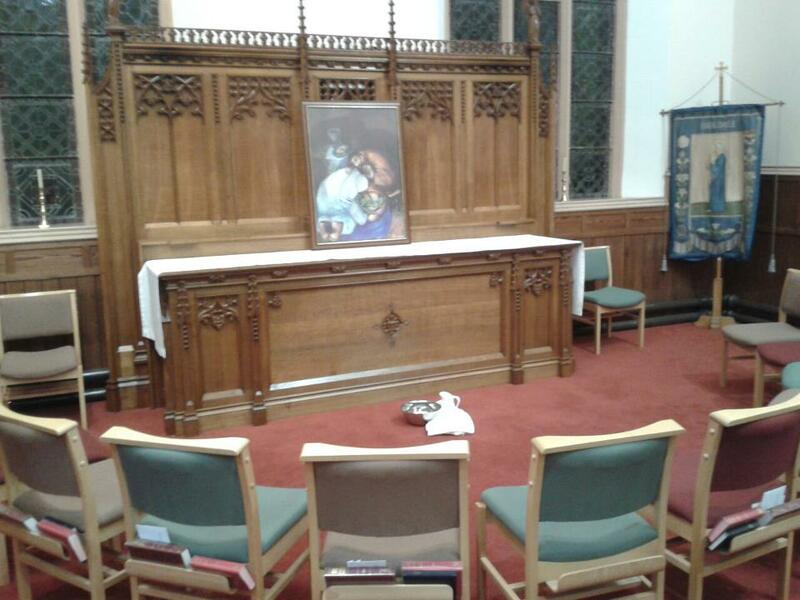 We have offered prompts – making use of the testimony of the building itself as an Ebenezer (a reminder of an encounter with God in the past) and the testimony of several Psalms – and given people as much room as they have wanted to spend time with God. We have had conversations with, and/or prayed with, those who have wanted it; allowing others to slip in and out anonymously. We have been absolutely thrilled by the testimonies we have heard throughout the week. Firstly, just the right number of people came through the building: never so many at once that the space was too busy, but a constant trickle through the week, and a large number in all. 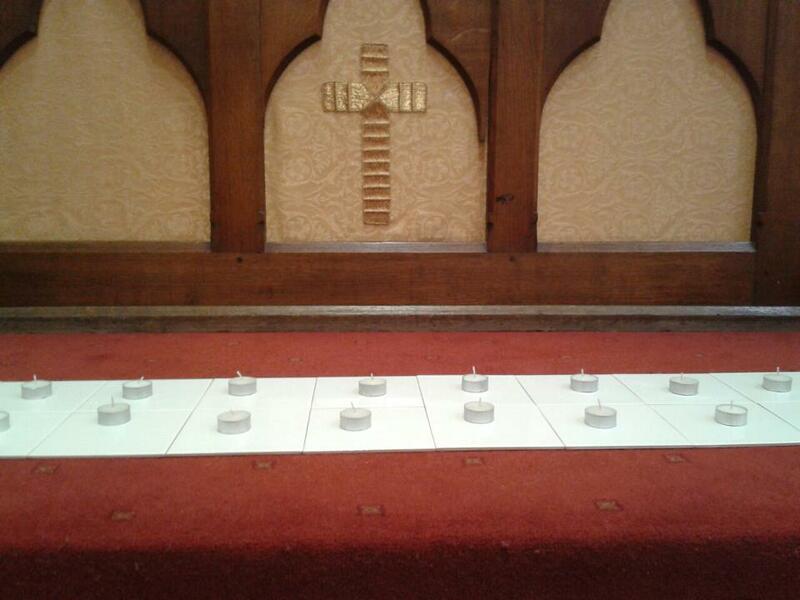 People engaged with the five prayer stations – it was great to see people engage in ways we hadn’t suggested, as well as ways we had, taking an ownership for responding as the Holy Spirit prompted them – and really appreciated the opportunity; and afterwards, several told others, who in turn came themselves. But over and over again, it was the Labyrinth in the centre of the building which people found to be the most profoundly moving experience. 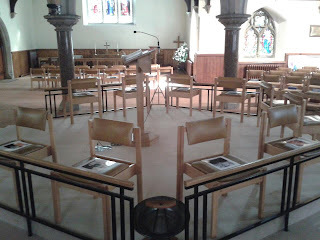 As they had moved from place to place around the building (a journey that was not dissimilar to a Labyrinth itself) they had opened themselves to God; and again and again experienced God’s Spirit speak to them, or minister deeper than words, most personally in that central space. Again and again God spoke through the twists and turns of the path. So who came? Some were members of our own congregation, who came in two-hour blocks so that the church could be open, and found the experience deeply healing. 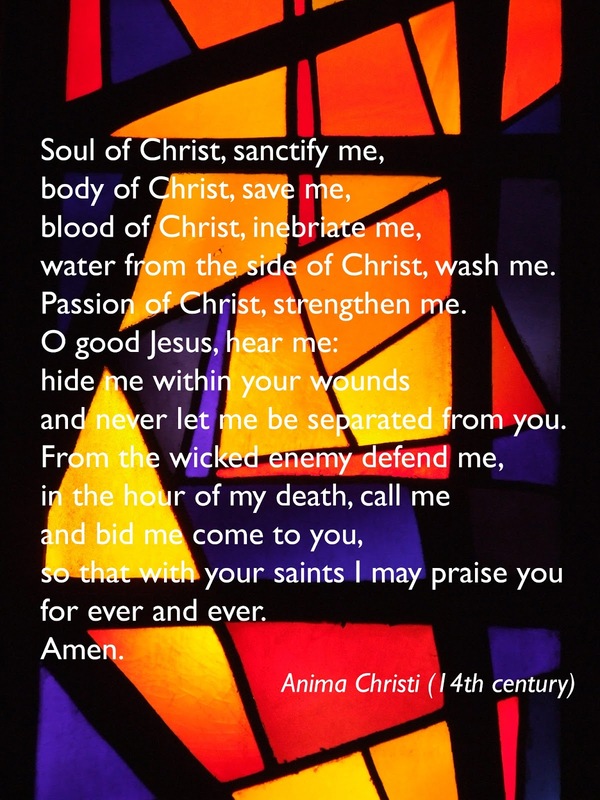 Some were members of our sister church, who encountered God in a way that they would not at St James,’ and discovered that there are ways in which the two churches can work together and complement each other in mission. (In my opinion, this may well turn out to be the most significant lasting impact of the week.) 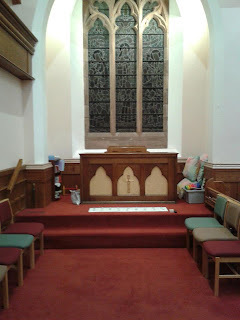 Some visitors had historic connections with the church, such as the woman who had been christened here some seventy years ago. Others had a pastoral connection – such as the couple who came in this morning to pray before going on to the inquest into their baby daughter’s death, whose funeral I took last year (I had not known, when I sent them a personal invitation, that the inquest was this week: but God knew). Others walked in off the street, passers-by, such as a Polish man with hardly any spoken English, and his young daughter. Some were deeply distressed but knew that peace is found where God is met. Many attend external groups that hire our Parish Centre throughout the week. Some had faith as robust as a mustard bush; others, faith as tiny as a mustard seed. Most, if not all, were in the midst of uncertain times, seeking God’s leading, one step at a time. Sometimes we think that we need to speak on behalf of God. This often sets up a dependency between those who understand and can communicate what people need to hear, and those who lack understanding/are not eloquent speakers. It raises the educated up and puts the uninitiated down. The irony is that this is utterly opposed to Jesus, who came to set people free. One of the things that I get to do on a regular basis is preach a sermon. 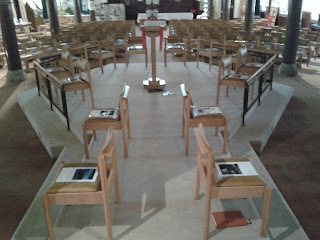 Sermons provoke various expectations (such as, ‘this will be boring’) but perhaps the most dangerous is that I am the ‘expert’ with a level of theological knowledge that the congregation cannot hope to aspire to – and indeed don’t need to because it is the specialist knowledge of my profession, the equivalent of what doctors know about the workings of the human body or civil engineers know about sewers or motorway flyovers. That is not the expectation I want to be working with, or want anyone else to have; but it is insidious. Rather, my expectation is that my role when I preach is (or should be) to draw out the lived experience of the people of God. Why? In part because the hope in preaching is not to impart information but to catalyse or to nurture – and perhaps to narrate – transformation. In part because the lived experience of the people of God has been lived longer and experienced deeper or wider by different members of the Body. And in part because some have lived so long and experienced so much that they have forgotten things that need to be drawn out of them once again. When I read scripture, I listen for what the Spirit of God wants to say to my spirit about who God is, and therefore who we are (for example, the revelation that God is our Provider contains the revelation that we are those provided for: this is covenant relationship); and/or about what God is doing and wants us to join-in with (this is kingdom partnership). But that listening process is best done corporately. This Sunday, I will be preaching, reflecting on Isaiah55:1-9 and Luke 13:1-9. I will offer my observation that the Isaiah passage reveals God’s playfulness, both in terms of how God wants to relate to us and in terms of how God chooses to teach us. Then I will ask, does this idea – that God is playful – ring true with what we know about Jesus? 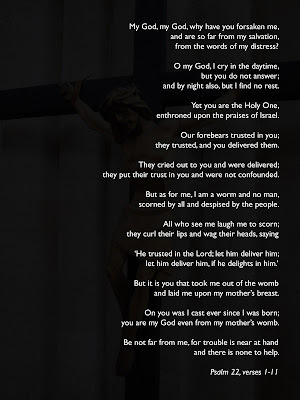 Here I will suggest that the Luke passage presents Jesus responding to Big Questions (raised by the abuse of political power and culpable negligence; questions such as Why does a loving and powerful God allow suffering? Do bad people experience judgement, and good people reward?) by playfully telling a humorous story (of a man so diligently focused on what he thought was required of him that he failed to notice something else, until it was indirectly brought to his attention in a way that did not chastise or humiliate him). I will also ask, does this idea – that God is playful – ring true with personal experience? And here, I will share stories of my own experience. But that is by way of setting something before everyone, to say, amongst other things, what can you teach me? What have you learned of God’s playfulness that I can learn from you; that we can learn from one another; that we can learn together? My sense is that this is something important, that we are tempted to trivialise; that this is the word that God wants to speak not only to me but to this community at this moment. My role is to give a steer. Not to impart the Right Answers. My name is Andrew Dowsett, and I am an ordained Anglican serving in the Church of England Diocese of Durham.